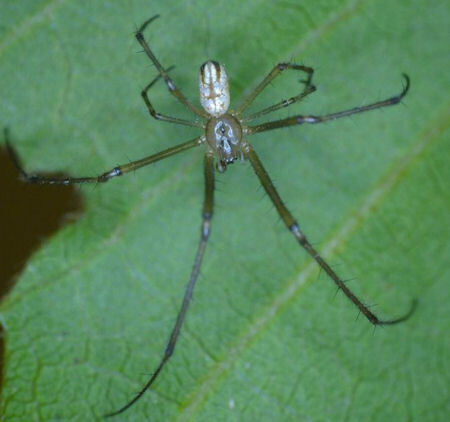 Spiders in this family and long and slender. 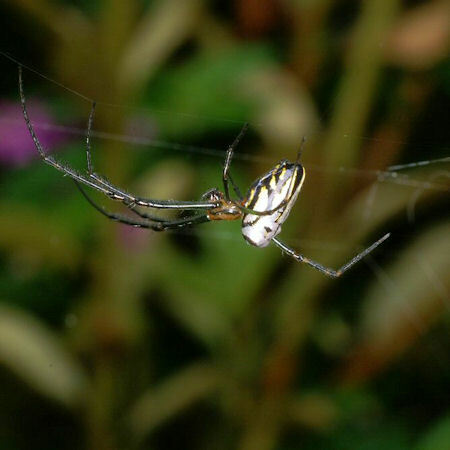 They make large orb webs with a hole in the center. 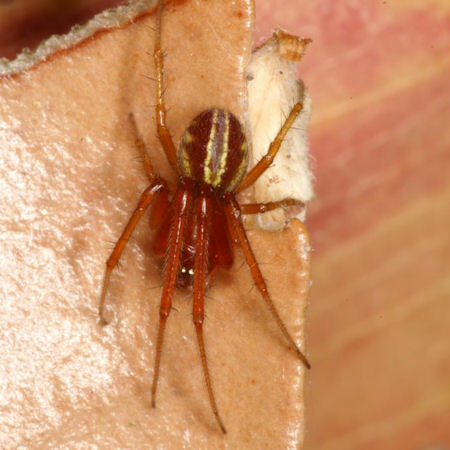 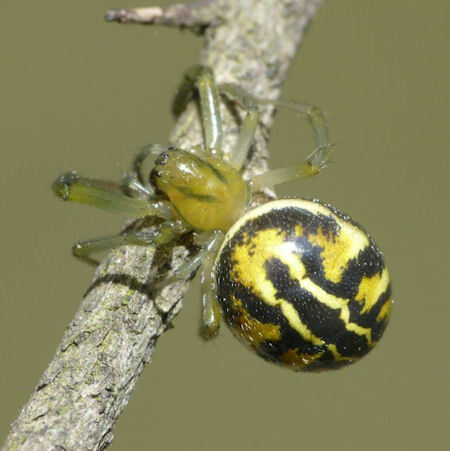 This genus is closely related to Phonognatha (Araneidae), the leaf curling spider. 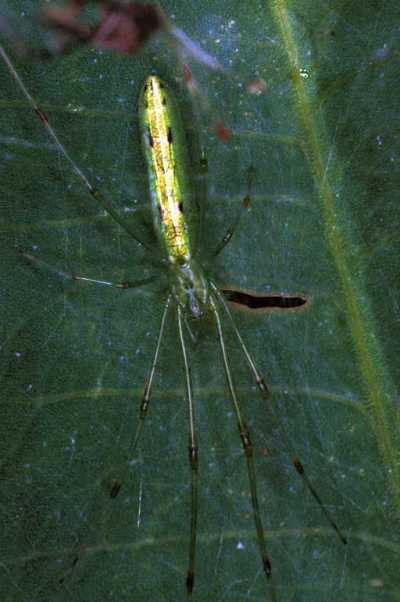 It is also a leaf roller. 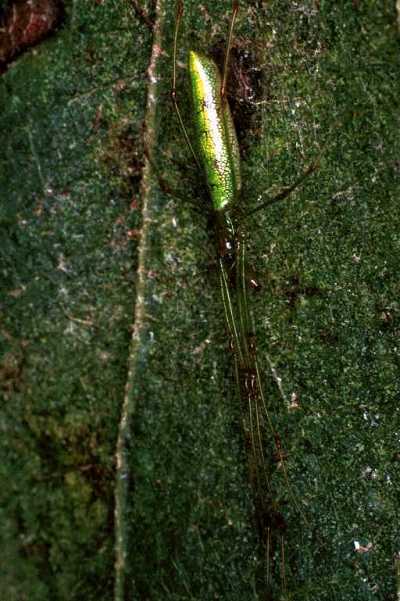 Two species are described in this genus, Leucage decorata and Leucage granulata (was Leucage dromedaria) . 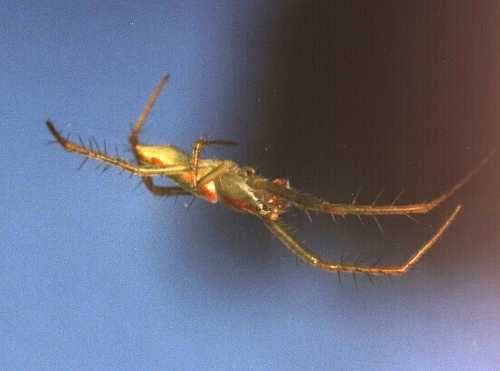 Its common names are Two-humped orb weaver, Camel spider and Silver orb weaver. 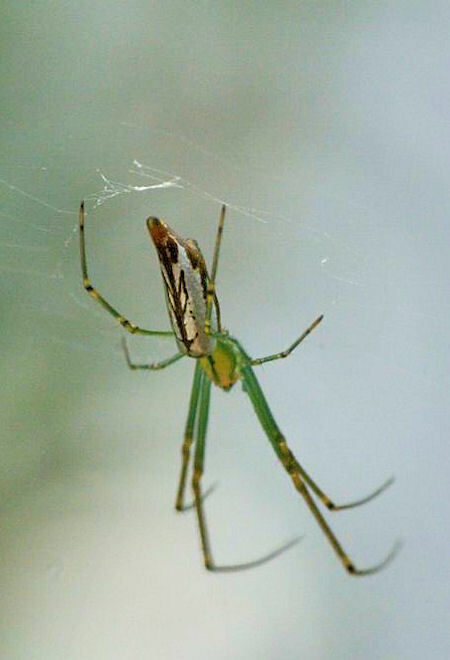 The horizontal constructed orb webs have a hole in the center through which the spider sticks its abdomen when she hangs in her web. 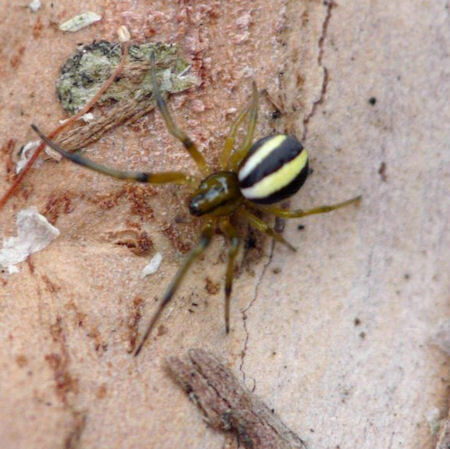 They build their large orb webs with a diameter between 20 and 40 cm in grass near the ground in moist situations such as along shady creek banks These spiders can be found in QLD and NSW. 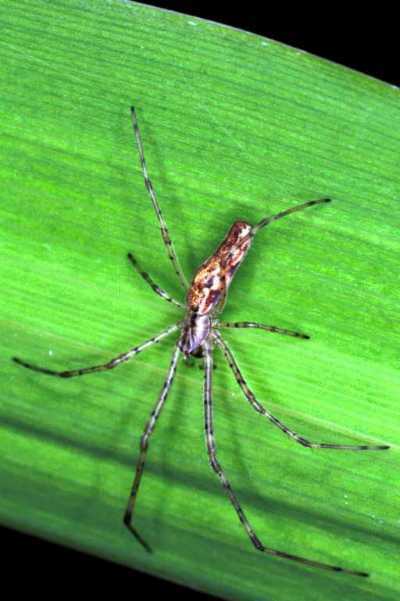 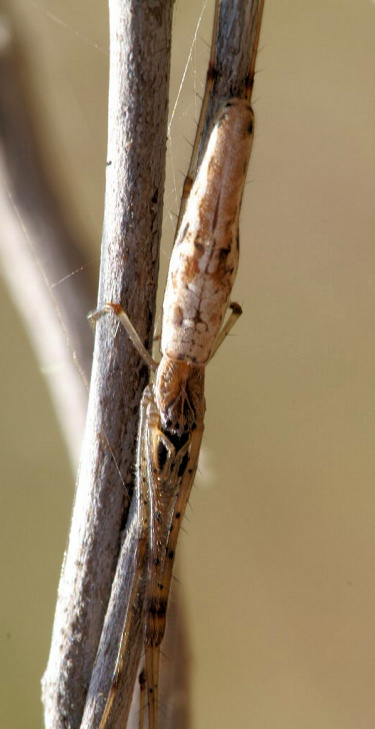 Males are around 5 mm in length and female 10 -15 mm. 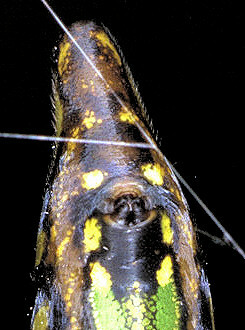 Leucage decorata. 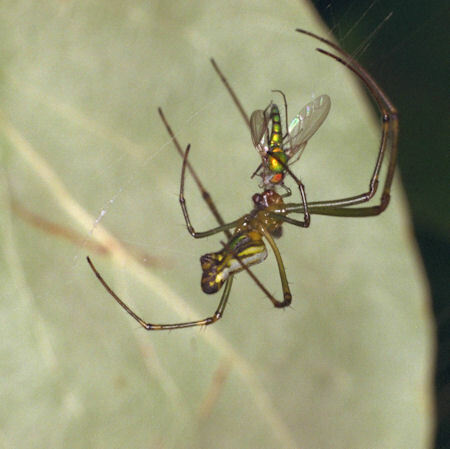 (top and left) with prey and above the ventral (under side) of the spider where one can see the spinners. 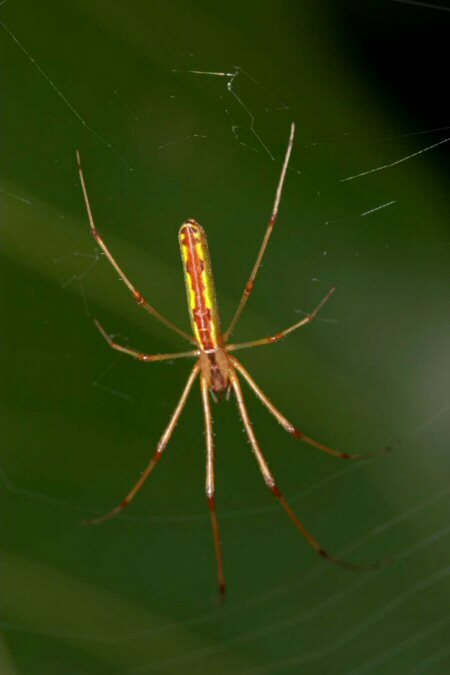 This family probably arose from the same evolutionary line as the Araneids because they also build orb webs. 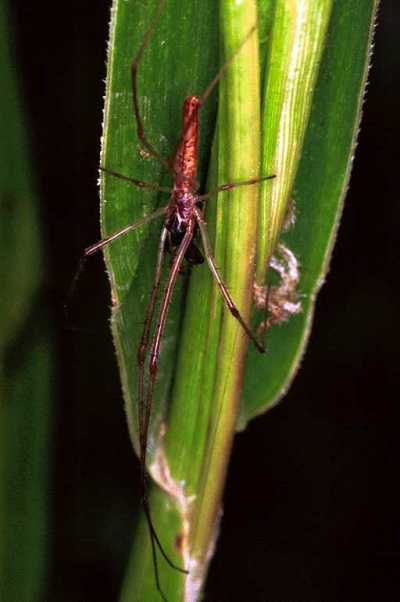 Members of this family are often found in grassy, damp, swampy habitats. 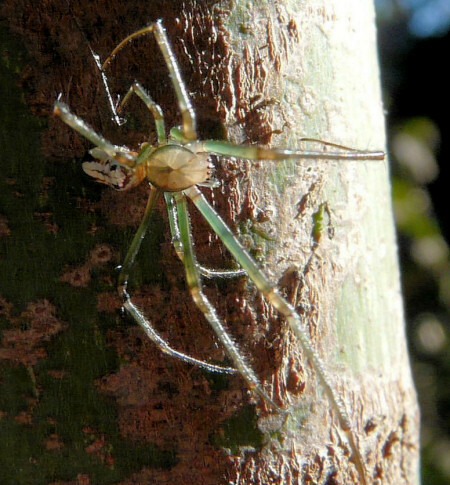 These spiders have long slim bodies and their abdomen has a metal shiny look. 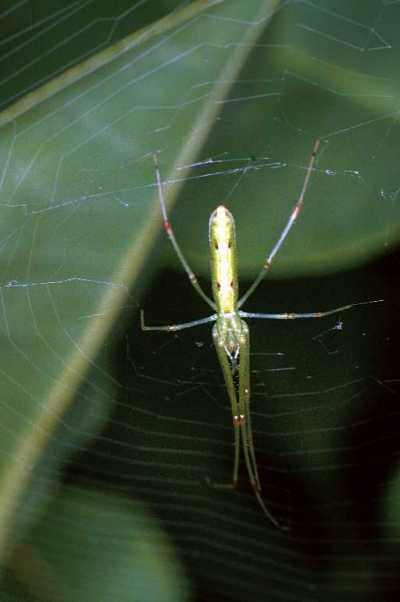 They build orb webs with an open center like the Metidae. 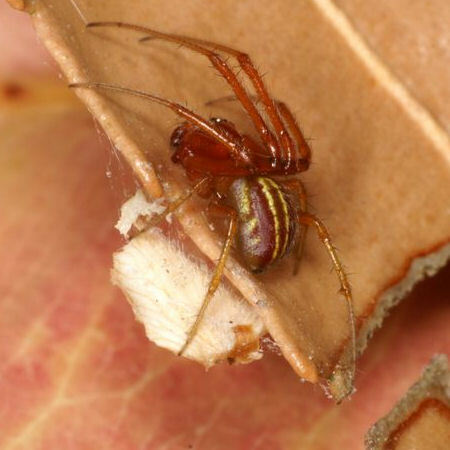 When the spider is not in the web she rests stretched on a reed twig or grass leave. 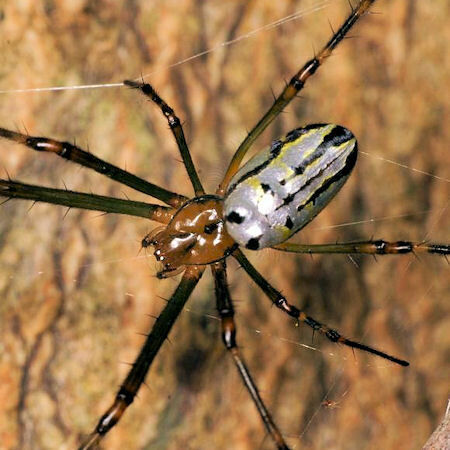 If the spider is disturbed she usually drops to the ground. 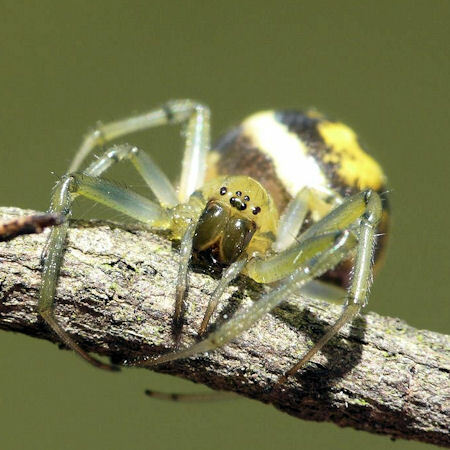 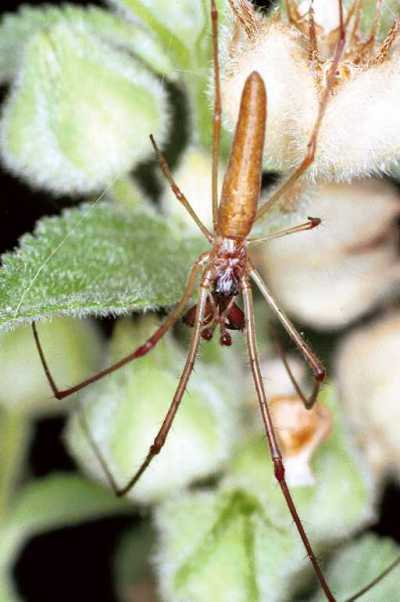 Most are greatly elongated spiders with very thin, long legs; the chelicerae (jaws) are of great size, especially those of the males, which often project in forward in a horizontal position. 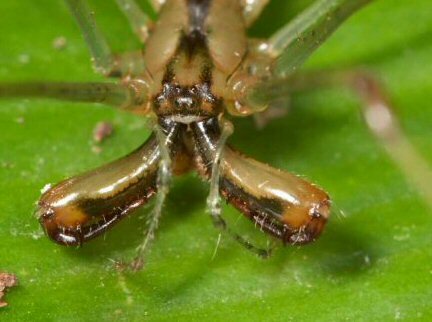 The jaws together with the two long palps it appears as they have four jaws. 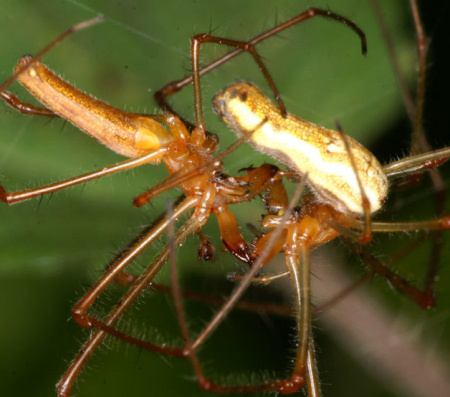 During mating the chelicerae of the male are gripped in those of the female. 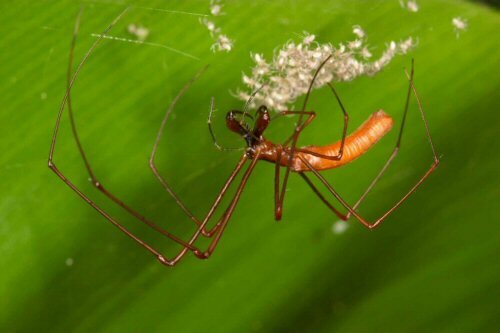 The size of these spiders varies between 10 and 20 mm. 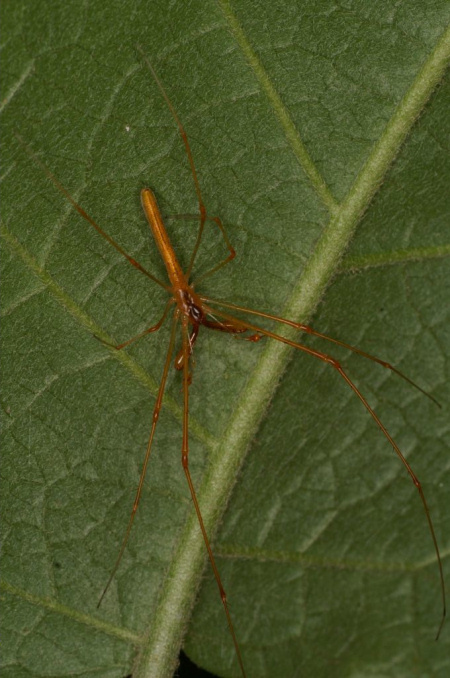 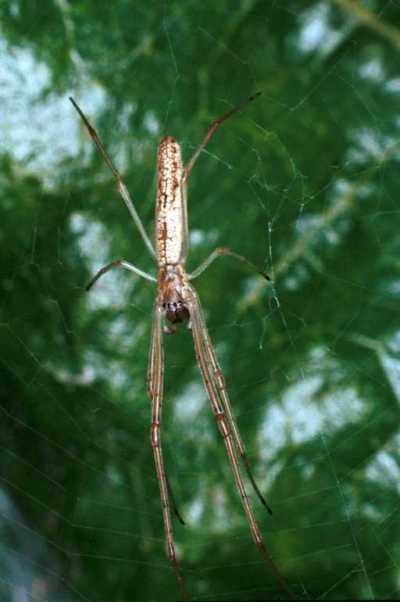 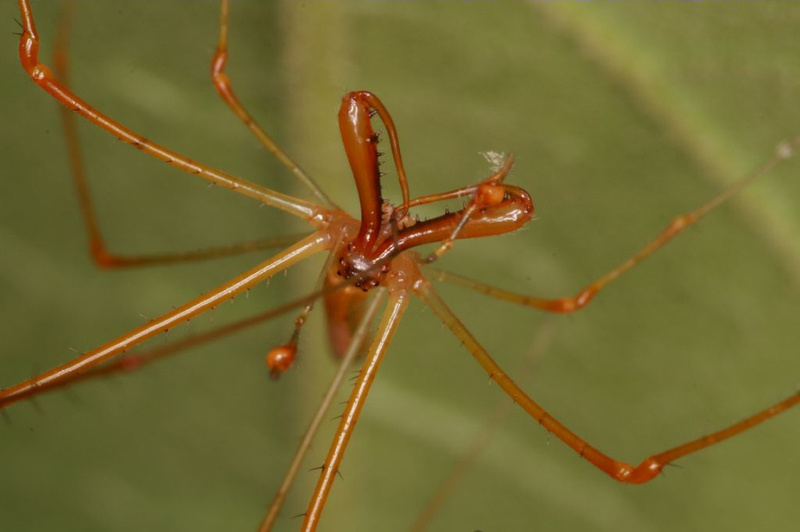 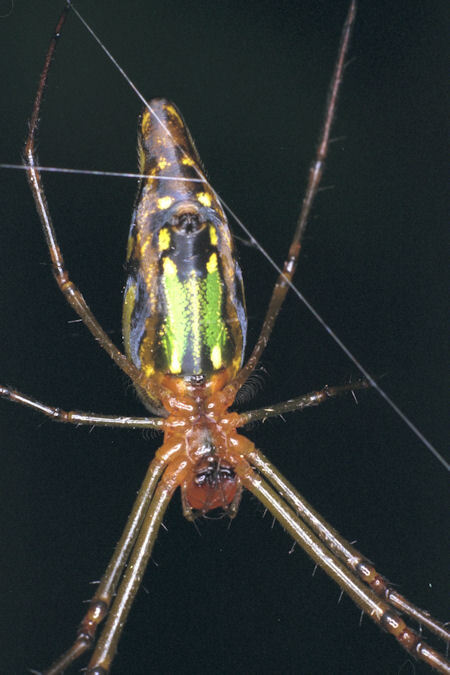 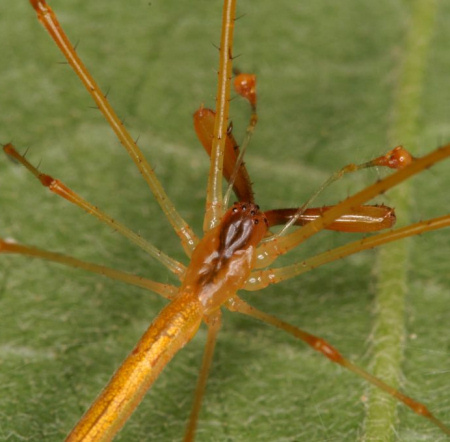 Twenty different species of the 1000 world-wide can be found in this family Tetragnatha (Latin for "Four-jawed"). 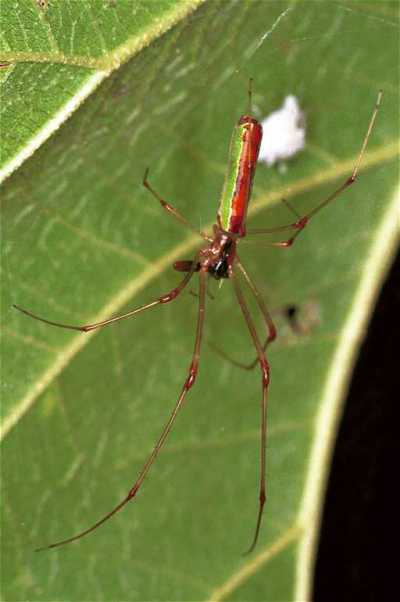 Tetragnatha demissa is a common stretch spider in Eastern Australia. 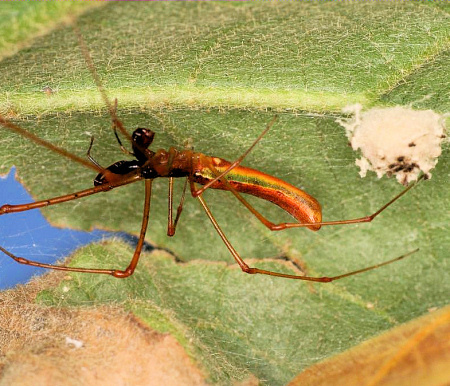 The male has a body length of 10 - 12 mm and the female 12-14 mm. 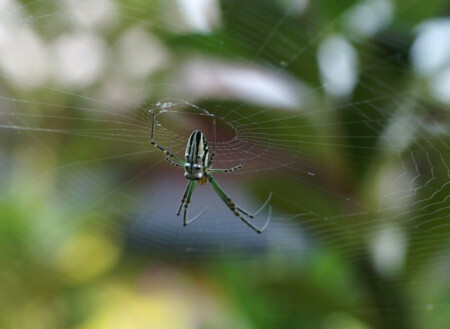 The spider builds her web 1 - 1.5 m above the ground amongst grass and low vegetatation. 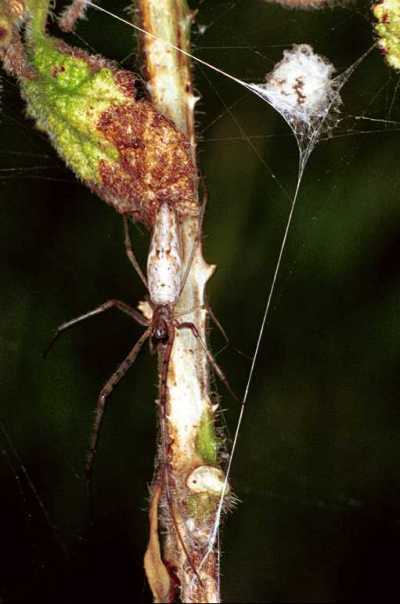 She constructs white egg-sacs with a diameter of 5-6 mm that contains 50 - 60 eggs.